Digging a hole 7.5 percent deeper might not sound like too tough a task. And deepening a spot in a river by 3 feet might not sound especially challenging, either. But this wasn't a spot in a river. 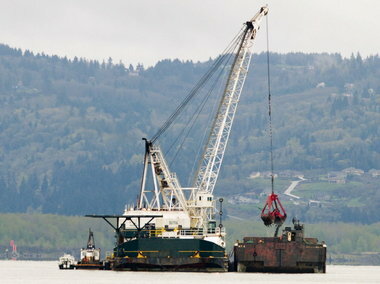 The dredging of the Columbia River was a five-year, $190 million project that had been planned for two decades. Now it's done and that massive "Whew!" you hear from the waterfront comes from port officials. On Thursday, they gathered with politicians, business, labor and agricultural leaders -- about 275 folks in all -- at the Port of Vancouver to celebrate the project's completion. More significant than the obvious fact that bigger ships now can ply the Columbia, other ships that have long used the river now can carry bigger cargos. For grain ships, this means adding about 10 percent more grain per vessel. In an industry that carries razor-thin profit margins, that change can be drastic. For amateur excavators who want illustrative details about how big this challenge really was, at one point between Ridgefield and St. Helens, Ore., more than 600,000 cubic yards of hard basalt had to be broken up by explosives and removed from the river bottom. A vast variety of equipment -- including mechanical claws, pneumatic scoops and gargantuan vacuums -- combined to dig a deeper river. Some people might say the worst economic crisis in seven decades is the worst time to embark on such a huge project. Visionaries, though, say it's the best time. Now the ports of Vancouver and Portland, and more downriver, are poised to hit full stride quickly when good times return. One result of that aggressive strategy already has emerged. As The Columbian's Aaron Corvin reported Friday, Australian mining giant BHP Billiton has reached preliminary agreement with the Port of Vancouver to ship fertilizers for crops from Terminal 5. The river dredging was one of the keys to that agreement. And downriver, a new, $230 million grain elevator in Longview will benefit from the deeper channel. The dredging project was completed more than two years ahead of schedule, thanks to a $29.6 million jolt of federal economic stimulus money earlier this year. U.S. Sen. Patty Murray, D-Wash., has long been a supporter of the channel-deepening project and helped secure $140 million in federal funding. Full disclosure: Several years ago, The Columbian editorially opposed this project in its planning stage. But as environmental concerns were resolved, and as it became clear that virtually every elected and public official in the region supported the project, our stance changed. We're also encouraged by the potential economic impact. In 2005, when the dredging began, more than 1,000 businesses and farmers throughout the Pacific Northwest were shipping $17 billion in cargo on the Columbia River annually. More than 40,000 jobs depended directly on the river, and thousands more indirectly, as 40 million tons of goods, grains and new cars moved through the channel each year. How those figures will grow as a result of the dredging project depends on the pace of the recovery. But already we know this much: The river is ready. And business recruiters from the ports are carrying a much more compelling case as they travel the globe looking for new clients, ones that can help our region answer its most critical economic need: new and good-paying jobs.